Everyone in New York wants to have a startup these days, and often, that means taking something that is tired, and improving the “user experience” and otherwise making the whole thing bright and shiny. Disruption. 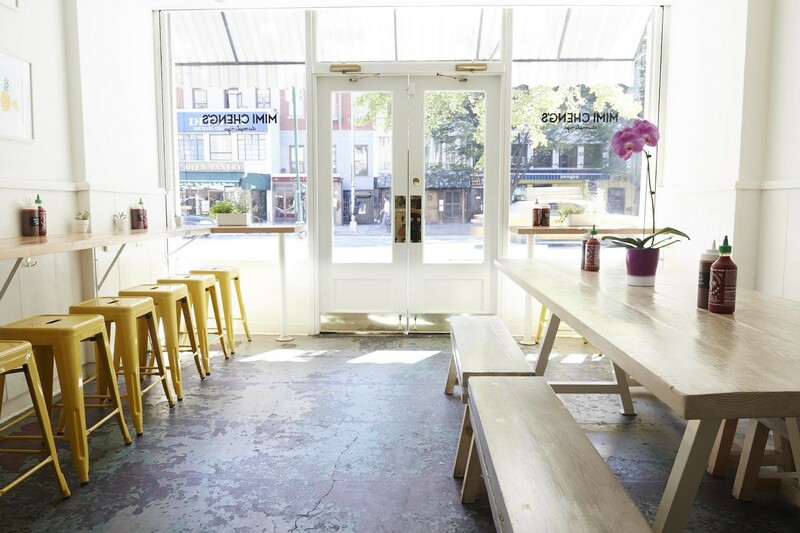 So think of it this way: Mimi Cheng’s is the Silicon Alley startup of dumplings. They even have those bright yellow Ikea stools that we’ve seen at every new tech company in Flatiron. And yes, they have some very good dumplings. Of course, many places do, and all startups are sure to come across naysayers who think the existing technology is just fine. So if you believe some kind of divine dumpling law states that all dumplings must be served in places with all the charm of the DMV, that’s just fine - and lucky for you, there’s no shortage of such establishments. Mimi Cheng’s is a spiffed up version of the dumpling experience, which makes it pretty different from hitting up Vanessa’s or Tasty Dumpling. That means eco-friendly containers rather than styrofoam, and your order taken on an iPad with a smile. It means a really excellent, homemade tangy sauce, rather than crusty bottles of sriracha. It also means grass-fed chicken and pasture-raised pork. And finally, it means you’ll pay $8 for six dumplings, rather than $1.50. Our vote: it’s still a good deal. And it’s cheaper than the tickets to our new conference, Dumpling Disrupt. This is the pork dumpling - and it hits the spot. You can get it boiled or fried. We recommend fried. The house specialty. Aside from a variation in shape, it’s pretty similar to the Reinvented Classic. We’d get a mix of the two. We vote chicken or pork, but some people like their dumplings vegetarian. This is the Fall seasonal special, and it’s served with a black vinegar sauce. We like the classics, but worth a try on a repeat visit. There’s a side of broccoli. It’s one of the rotating sides, if you need a vegetable. A bare bones spot for some of the best fried dumplings in Chinatown. The second location of the modern dumpling spot.